Greening Bridgeport... One Street At A Time! There is nothing simpler or more attractive than a Frisbee in flight. It's pure beauty in motion, it captivates the imagination. This is how the workers at the Frisbie Pie company must have felt when they were messing around with the pie tins, flinging them so they would rest on a cushion of air and fly a great distance, thousands landing at the bottom of the river we are told. So it's no surprize a company making things out of a new material called plastic thought to improve on the design and come up with one of the most popular and resilient toy in the world, now a serious sport. When we were organizing the first Green Market Exposition at the Barnum Museum, we were looking for something to represent the City of Bridgeport, its spirit of innovation, its long association to the local avionics and aeronautics community, and so we decided to make the Frisbee the symbol of our event. I knew Wham-O sold a recycled plastic version so I envisioned artists painting the top of Frisbees, putting them on display at the Expo and at auction to raise some money for green projects. I contacted the Wham-O recycled Frisbee licensed manufacturer Discovering The World, who agreed on a good price, then we started looking for a sponsor. We were not able to raise the funds in time for the 2009 GME, but at the expo, one of our guest speaker was Robert Araujo from Sikorsky, who liked the idea, and helped us get it through committee. A few days ago two large boxes were delivered on my doorstep, containing 200 Reflyer 100 Mold Frisbees, 60% post-consumer recycled polyethylene, ready to be painted. Artists can stop at some of these participating galleries and green businesses to pick up their blank Frisbee: City Lights Gallery, Day One Skateshop, Center For Green Building, and the Green Living Center at the Saugatuck train station in Westport. You will be asked to sign a short release form agreeing to return the Frisbee with art work painted on it in due time for the auction at the Green Market Exposition starting October 8th 2010 at the Barnum Museum. You can also download this Word File form and mail it in. 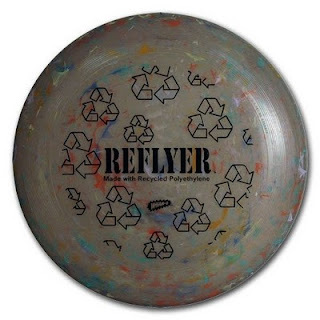 We will send you a Frisbee in return mail. But if you pick them up in person at the above locations, you will receive a free sample bottle of Citra Solv, a safe, bio-degradable solvent with a multitude of art uses. Citra Solv is based in Danbury. For paint to properly stick on polyethylene, you must use enamel paint, or first prime the surface of the Frisbee with a clear coat and use acrylic paint. I know it's not the greenest thing around, but we will start working with Arts, Crafts & Theater Safety to identify the most environmentally friendly acrylic paints and methods out there. If you want to read more about the history of the Frisbee, you can find an entire chapter in Bridgeport: Tales from the Park City by Eric D. Lehman. The other day I had the wonderful opportunity to witness Bridgeport Mayor's Conservation Corps in action. It's almost the end of the season, so the group was much smaller than usual, but I got a chance to experience change in motion. In the photo above you can see left to right: Damtia Agee, Jahaida Diaz, Marquese Griffin, Patrick Peluso Jr., Richard R. Hines, Trysh Brown, Tori Brown. Since July, almost everyday of the week, Lisa Bretton Miro, Park City's conservation coordinator (below), has been training and putting dozens of dedicated young men and women on the streets of Bridgeport to canvas neighborhoods, educate residents about a myriad of recycling, tree planting and energy saving measures for their homes or business, including a rain barrel program to reduce storm water pollution. On the table you can see a few copies of E The Environmental magazine and a small selection of light emitting diode bulbs (LEDs) which I brought with me for the occasion to show and tell. 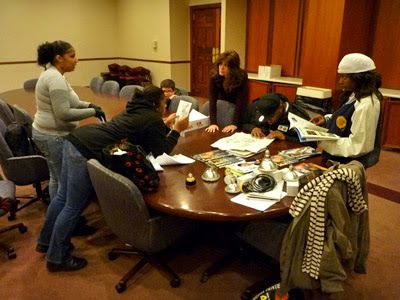 Before heading out into the streets to canvas, each volunteers meet in a prep room at City Hall where they map out their route. 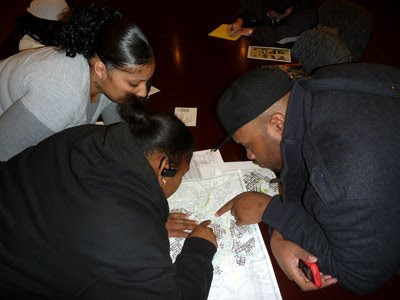 A small bus takes them to destination where they spend the afternoon knocking on doors, talking to homeowners, asking them to fill out a fun, but detailed questionaire about their willingness to participate in future activities to green and beautify their neighborhood.